Our customers are constantly referring us to new customers. Find out what sets us apart from the competition. The staff at Solazzo Marble and Granite helped take the guess-work out of installing granite in my home. They were very knowledgeable and professional. The installation process was exactly as expected and my project was done on-time and on-budget. After looking at granite samples all over town, I found the largest selection at Solazzo Marble and Granite. I was able to see full-size slabs instead of just small samples, which helped me visualize my entire project, and find the granite that was just right for my home. I would not change a thing about the process. We just finished our third home, and Solazzo Marble has been there for each one of them! They're professional, compassionate and talented staff made it an easy choice. They offer the best product, selection, and service bar none. We receive nothing but complements on the granite, marble and tile that we have in our home. I would recommend Solazzo Marble & Granite to anyone so they can experience what we have. I want to express my sincere gratitude for your family's attention to my needs over the last few years. I built a beautiful home 4 years ago and continue to admire our awesome granite countertops that your company manufactured for us. It is clear that at Solazzo Granite and Marble Company there is an overwhelming sense of pride in both the quality as well as craftsmanship of your products. Your selection of granite products is vast. Your prices were unbelievably low compared to some of your competitors. You delivered the final granite product on time and have always been available for any follow up concerns. 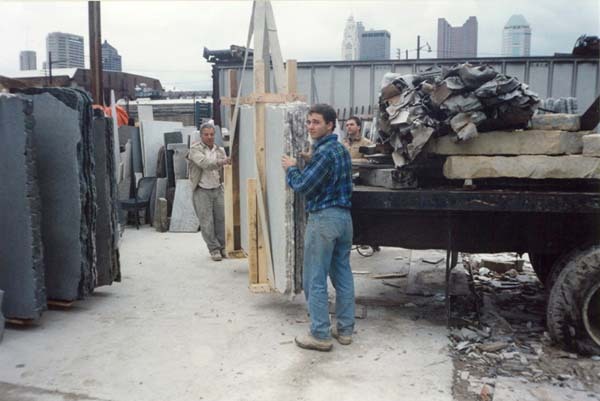 The most rewarding complement the Solazzo Family Granite and Marble company can receive is that we would never think about using another company for countertops again. We recommend your granite to all those in the building process. We had the most wonderful experience at Solazzo marble. Their product line is extensive and their prices are highly competitive. Not only do they really know about the products, but they treated us like family. You can't find the service and attention at other marble and granite companies. We recommend EVERYONE to Solazzo marble.